With the capacity of 45-750t/d, lower energy consumption, superior quality and the most competitive price, our testliner paper making line enjoys the good command and admission of our customers. Testline paper machine, also called kraft liner board machine is to produce testliner paper. The testline paper manufacture line also can be divided into two parts: pulping making line and paper making line. We usually make high quality testliner paper with materials like commodity wood pulp, waste paper and so on. Various kinds of pulp board, waste paper are conveyed into Drum Pulp for pulping by Chain Conveyor. To remove and screen waste paper pulp, meanwhile, separating the light and heavy impurities from the pulp, you can choose High Density Cleaner, Mid Consistency Cleaner or Low Density Cleaner. 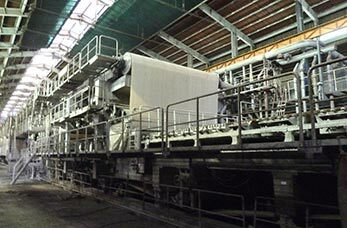 The process of paper making line contains: Forming part, Press part, Dryer part, Calender part, Rewinding part. Customers can make high quality testliner paper with materials like commodity wood pulp, waste paper and so on by using our kraft liner board paper making line.